efficiency and save you money! An important consideration in building, managing, buying, or owning a home in the Pacific Northwest is moisture levels inside of the home. 80% of issues in a residential home are moisture related. Moisture levels elevated during the construction of the home caused by rain, building envelope issues or elevated moisture levels during the life of the home may cause structural, cosmetic, and health risks. An additional important consideration is the home's energy performance and comfort. Being the industry leader in determining levels of moisture content inside of walls and floors of existing homes - issuing the exclusive Dry Score™ Certificate of Moisture Content. 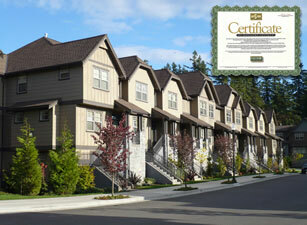 Assisting in the evaluation and improvement of your homes energy performance and comfort. We complete these specialized services following a detailed protocol and using state-of-the-art moisture detection, drying equipment and diagnostic tools. To read more about our specialized services, please click on one of the links above or click here to Contact Us.